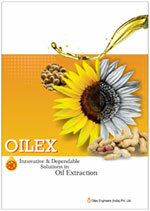 The Directors of Oilex have decades of industrial experience in the field of Process Design, Equipment Design, Process equipment Manufacturing, System Integration, Plant Design, Plant Modifications, Automation, Project Management & Process Consultancy and are well known in better circles of Edible Oil Industry. Oilex supplies top quality products and world class customer service through ethical and best practices, offering our customers complete product satisfaction. Our products are bespoke, to meet our customer’s demanding requirements and specifications. We work to the highest standards in our industry and strive for ongoing business growth and development and strive to surpass customer expectations through our innovative and cutting-edge production facilities. Oilex is certified as ISO 9001:2008 and have also won Niryat (Export) Ratna Award for Exporting the best Machinery for Solvent Extraction Plant. We share this honor with only a few other companies in the country. Oilex is associated to the global players in this sector and has been able to handle challenges creatively provided by the clients. We have a global business base and are equally attentive to small start-up companies as with our multi-national clients. Oilex has served to more than 200 customers till date and the number is still increasing. We have forged a strong longstanding relationship with many of our customers and our commitment to meeting time-lines, providing prompt communications and maintaining the quality of our work has resulted in a high proportion of repeat business.